Chiefs at London's Heathrow Airport have defended their decision to cancel a fifth of scheduled flights over the weekend. Irate passengers, who camped out on the terminal floors for a third day on Sunday, strongly criticised the airport for being slow in passing on information and getting air traffic moving. A total of 260 flights were grounded at Heathrow, the busiest two-runway airport in the world, with reduced visibility requiring a longer gap between flights. The airport is managing well and made sure passengers received advanced notice of cancellations, a Heathrow spokeswoman insisted. Nevertheless, it is vital passengers take out travel insurance during the cold snap to cover costs incurred by delayed or cancelled flights. Heathrow had announced its flight schedule for today would be cut by 10% - approximately 130 flights - but that figure is likely to soar with low visibility forecast from 4pm onwards. The airport is encouraging passengers to check the status of their flights with the airline before travelling and to allow extra time for their journeys. 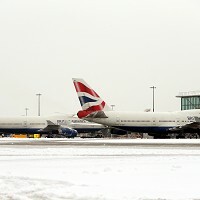 Heathrow came in for heavy criticism when snow and freezing temperatures almost closed the airport back in December 2010. As a result air chiefs invested £36m into a Winter Resilience Programme, which was spent on bolstering snow and ice clearing equipment and upping staffing levels.